Izanami chef’s recipes call for the best, freshest ingredients, and simple preparation. 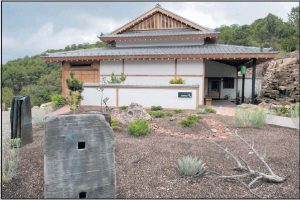 A Japanese-style restaurant in the high desert that features seasonal and locally grown food might sound like an oxymoron, but the more you learn about izanami at Ten Thousand Waves in Santa Fe, the more a dish like nasu dengaku (Japanese eggplant with miso sauce) seems natural, even for locavores. According to executive chef Kim Müller, it all starts with the concept of the izakaya (pronounced ee-ZAH ka-ya), the Japanese term for a tavern that also serves food. Abundant across Japan, these casual, loud, small eateries feature sake and kozara (small plates) that come out from the kitchen as they are ready. The izanami restaurant is located at Ten Thousand Waves in Santa Fe, which is styled as a Japanese izakaya, a tavern that also serves food. Nor does izanami serve sushi. Müller says the restaurant may occasionally serve fish as a special, but she prefers to focus on creating delicacies from fresh vegetables, beef, chicken and pork, and 90 percent of the ingredients are organic and sustainably grown. She also tries to use as much locally grown and raised food as she can, though pricing and reliability can be challenging, Müller says, due to New Mexico’s relatively short growing season that generally spans four to five months. Müller, who grew up in California, was cooking her way through graduate school in Pennsylvania while studying sports psychology and playing tennis, when she shifted gears to become a chef. She contemplated going to culinary school, but her mentor at the time told her to just keep doing what she was doing. And so she did — cooking in New York, Chicago and Los Angeles. Müller has now been cooking in Santa Fe for 21 years at restaurants such as the Compound, the Galisteo Inn and Real Food Nation. Though she didn’t have a background in Japanese cuisine, her penchant for sourcing organic, fresh and seasonal ingredients made her the perfect choice. The ethos at izanami requires showcasing individual ingredients in a way that complements the simple aesthetics of Ten Thousand Waves, a picturesque soaking destination that sits at the base of the Sangre de Cristo Mountains. August is a prime time for Müller to receive locally grown tomatoes, peppers, corn, onions, potatoes, fava beans, eggplant, kale and chard. But given the challenges for a restaurant to purchase local food (i.e, delivery, pricing and product) why does Müller bother? “If we don’t support small farmers they’re going to go away,” she says without missing a beat. It’s that simple. “I really like going to the Santa Fe Farmers’ Market before coming to work, but now my days are too long if I shop at the market early in the morning,” she laments. And so she relies on the Farm to Restaurant project for help with local produce purchases. Beyond local produce, Müller sources staples from a trusted California distributor delivered several days after harvest; the wagu beef comes from Lone Mountain Cattle Co. south of Madrid; much of the lamb comes from Talus Wind Heritage Meats of Galisteo; and the pork, while not local, is from Heritage Foods USA, which supports farmers who carefully raise their animals. In winter one of the most popular menu items are Brussels sprouts; in spring there are divine asparagus dishes. 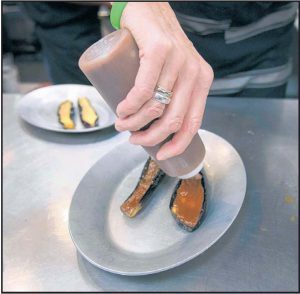 But now that summer has arrived, eggplant, or nasu, in Japanese, is a must-try from izanami’s tempting menu. Watching Müller prepare the nasu dengaku, it’s clear that the artistry is in the details. The recipe is not complicated and can be replicated at home. It begins by scoring the delicate Japanese eggplant in a crosshatch pattern, frying them lightly until the skin starts to shrivel and they are slightly brown, draining on paper towel, covering them edge to edge with the special den miso (a sauce that can be made ahead up to three days), heating under a broiler until they are caramelized, and topping them with toasted sesame seeds. The method is simple but the results are extraordinary. The meaty yet delicate taste of the eggplant combines in mouthwatering tenderness with the sweet and salty flavors of the miso, mirin and sake. “None of the food is that hard to prepare. It’s basically simple food. Buy the best quality ingredients you can get. And then pay attention to the little things,” says Müller. In June, Müller spent time in Japan learning more about rice and miso, and the regional specialties of each. Not all rice is created equal, but for the uninitiated, miso opens a Pandora’s box. Miso is a naturally fermented paste made by combining cooked soy beans, salt and often other ingredients such as white or brown rice, barley and so on. The texture can range from smooth to chunky, and the color from a light yellow-brown to reddish brown to dark chocolate brown, and the flavor ranges from mildly salty and sweet to strong and very salty. It is commonly used to flavor soups, sauces, marinades and glazes. Müller provided a quick overview of the major types of miso (white, yellow, red and specialty varieties such as hatcho), but if you are new to shopping for miso paste, starting with the color can be a fairly good indicator of its strength of flavor, age and saltiness. Once opened, miso pastes should be stored in a tightly sealed container in the refrigerator. The lighter varieties will keep for about nine months and the darker ones up to year. Check the sell-by date, and you may want to stay away from varieties with additives like MSG. Japanese eggplant is but one of many amazing local crops that are abundant at farmers’ markets during August. Try new foods, experiment with new flavors. And by following Müller’s example of paying attention to the details and using the best ingredients, we might all enjoy New Mexico’s peak growing season a little bit more.